TROOPER, the premium British beer created by IRON MAIDEN and handcrafted by Robinsons’ brewery in England is proud to present the Official Motörhead’s Motörboat Pre-Party on September 27 at the Clevelander Hotel in Miami Beach, Florida, hosted by SiriusXM’s Jose Mangin. 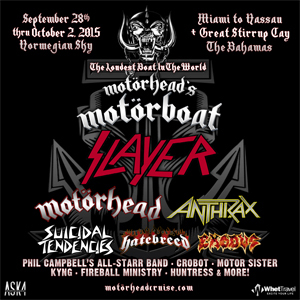 The following day (September 28), the second annual Motörhead’s Motörboat sets sail from Port Miami aboard Norwegian Sky. The Official Motörhead’s Motörboat Pre-Party presented by TROOPER Beer starts at 8:00 PM on September 27 at the legendary outdoor pool and patio bar at the Clevelander Hotel in South Beach (1020 Ocean Dr., Miami Beach, FL 33139) and continues until 1:00 AM. The party is free and open to the public (ages 21+), and will feature TROOPER item giveaways, TROOPER koozies for the first fifty guests to buy a TROOPER beer, a trivia contest hosted by Rita Haney, swag including IRON MAIDEN’s new album, The Book Of Souls, plus other giveaways and a raffle to win a Big OBC (on board credit). Throughout the night, DJ Lippy Rage will be spinning British heavy metal classics from the likes of BLACK SABBATH, JUDAS PRIEST and more--including, of course, IRON MAIDEN and MOTORHEAD. Motörhead's Motörboat—fueled by Monster Energy—will embark on its second voyage from Port Miami September 28 on Norwegian Sky, with stops in The Bahamas at the private picturesque island of Great Stirrup Cay and Nassau, before returning to Miami on October 2. MOTORHEAD will be joined on The Loudest Boat In The Wörld by nearly two dozen bands and comedians, as MOTORHEAD takes its 40th anniversary celebration to the high seas. The lineup for Motörhead’s Motörboat includes: Slayer, Motörhead, Anthrax, Suicidal Tendencies, Hatebreed, Exodus, Corrosion of Conformity, Phil Campbell's All-Starr Band, Crobot, Motor Sister, KYNG, Brian Posehn, Fireball Ministry, Huntress, Big Jay Oakerson, The Shrine, Others, No Words, Budderside, Sonia Harley and The Dead Deads. Recently added to the lineup are: Tim “Ripper” Owens, Mad Old Lady, Martyrd, Death Dealer, Dark Before Dawn, Santa Cruz and Gabbie Rae. Motörhead’s Motörboat will also feature The S.D.R. Show (with Ralph Sutton and Big Jay Oakerson) and will be hosted by SiriusXM’s Jose Mangin. Staterooms for Motörhead’s Motörboat can be purchased through September 20 at www.MotorheadCruise.com. Motörhead's Motörboat offers guests a once-in-a-lifetime opportunity to share an experience with their favorite bands and to see unforgettable performances on various stages throughout the ship. Norwegian Sky offers 13 complimentary and specialty dining options, 12 bars and lounges, a coffee bar, an outdoor pool, and five hot tubs. While onboard, guests can try their luck in the Sky Club Casino, relax in the onboard spa and get their heart pumping in the fitness center or full basketball court.